Imagine if you were completely cut off from your family. Barbed wire fences, landminieinfested borders and armed guards—not oceans or great distances—were what separated you from the ones you love. You couldn’t even send a quick text or chat with them on Facebook. Now imagine that your family is living in extreme poverty, without a regular supply of food or a warm shelter. How far would you go to reach them? What would you risk to bring them the hope they so desperately yearn for? That is the question our “war zone” partners ask themselves every day. Many of these heroes, whom you support, began their ministries because of isolated family members who were staving and trapped inside the closed borders of North Korea. It is because of their resilience and courage that Heaven’s Family can offer hope to numerous underground church families who are forced to live like prisoners inside North Korea. Because of your help in 2015, the North Korean Christians Ministry provided 220 North Korean families with food, medicine, warm clothes and other critical living supplies. As a result, most of these individuals have already given their lives to Jesus! In return, they will continue to draw more trusted family members and friends into their underground church network through these same evangelism techniques. It only continues to grow stronger every day! 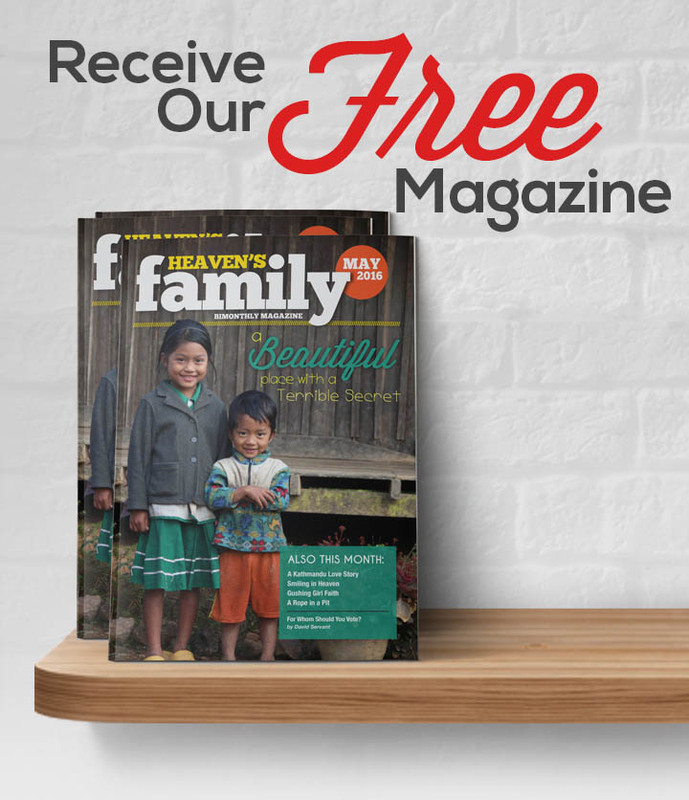 Your financial gifts help Heaven’s Family in supporting a special safe house, along the border of China, for North Korean church leaders who are so incredibly desperate for spiritual growth that they are willing to risk their lives leaving the country in order to hear the good news of Jesus Christ. In 2015, you provided the safe house with resources to disciple, pastor and train 6 guests per month, and equipped each guest with 3 months’ worth of supplies to bring to their church families back home. Our partners may have started these underground ministries to reach those close to them, but this network has evolved into a worldwide family of Christ. Thank you for sacrificing your financial gifts for the Christians inside North Korea, just as if they were members of your own family.